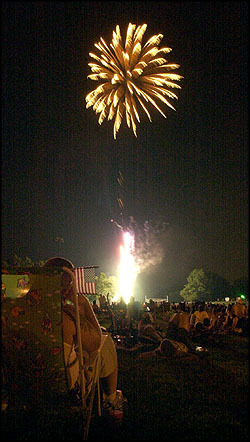 Denville - The annual Fireworks show accompined by the David Aaron Band, was held July 4th at Gardner field. 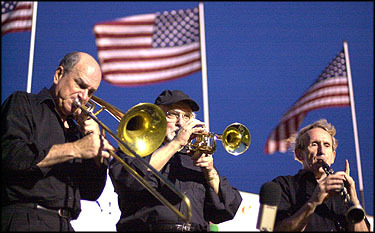 (above left) Chase Acito, Trombone; Leo Ball, Trumpet; and Bob Miller, Clarinete; perform some Dixie Land Jazz. (right) The fireworks explode over Gardner Field. 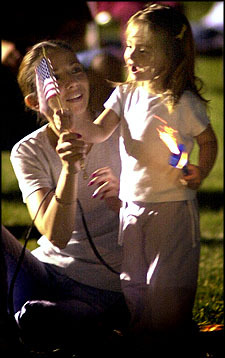 (left) Barbara Reichwald, of Rockaway, with her daughter Christina, enjoy the festive mood.